Evergreen Power Seeding offers environmental erosion control and revegetation services with the ability to access all types of terrain, even intensively worked grounds. The company’s mission statement is to sustain a modern approach to the environmental future. 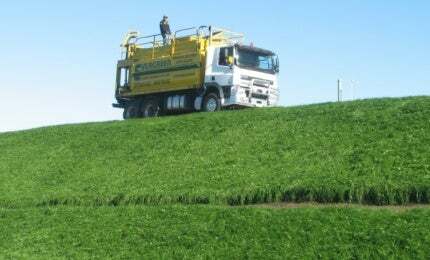 As landscaping consultants and designers who cater to large industry environmental concerns, Evergreen Power Seeding is equipped to manage the most challenging soil erosion and revegetation situations, utilising the industry’s most advanced agronomic technologies. Hydro-mulching is the hydraulic application of a slurry of seed, fibre, binders, fertiliser and water to the surface of the ground. Within a short time of application, hydro-mulch provides a stable protection against erosion. Evergreen Power Seeding uses the most modern and reliable machinery available that is capable of handling all types of terrain. Hydro-seeding and re-fertilising involves the application of seed and fertiliser via a liquid mix that is sprayed at pressure with a 100m handheld high-pressure hose, with a liquid reach of up to 40m. This process can also be used for the guar-based tackifier, hydro-mulch. Mulch is used to enhance germination and prevent loss of seed due to climatic conditions on slopes; it also has a green dye to enhance its appearance. Straw-mulching involves the machine application of straw onto seeded areas, together with an emulsion or binder to secure it in place. This enhances and protects the germinating factors of the seeded areas and greatly increases its ability to withstand rain damage. Wood fibre-mulch is applied hydraulically to unstable areas of anticipated erosion, which can be used as a basic treatment of wood fibre-mulch and binder, or combined with seed, fertiliser, emulsion or straw-mulch to obtain grass cover. The conwed fibre 2000 process is particularly effective on sheer slopes, steep batters and other unstable areas. The flex terra hydro-mulch system is designed for steep batter stabilisation and revegetation. Flex terra is a cost-effective method for solving erosion problems. It increases germination and retains moisture, while minimising erosion and helping reduce soil loss and water run-off. All types of seeding mixtures can be used with the flex terra process. Evergreen Power Seeding is a 100% family owned and operated business established in 1983. Together with on-site expertise and dedicated support, the company specialises in helping customers achieve the most economical way to keep soil on-site and to establish sustainable vegetation quickly. The company prides itself on offering a professional and friendly service and upholding the utmost respect for quality. The company is proud of its long-term contribution to the protection of the environment, and works in accordance with the codes of practice required by government. Evergreen Power Seeding is National Code ISO9001 compliant.